There are two types of magpie you could attract to your garden in North America: black-billed magpies, found across most of the western U.S., and yellow-billed magpies, found only in California. Although some consider them pests and think they kill other garden birds, it's likely this bad reputation has been somewhat overplayed. They are predators, but they're unlikely to eat eggs or nestlings if there's plenty of other food available. Suet is a form of animal fat. As omnivores, magpies are happy to eat meaty foods, and suet is a good bet to attract them. There are many commercially available suet balls or blocks, specially made for birds. It's an especially good idea to feed suet in the winter, when food for magpies is more scarce, as it's high in calories and fat, and will provide them with plenty of energy to keep them going. Carrion -- or dead animals -- makes up a large portion of magpies' diets. As such, putting out meat is a good way to attract them. A tin of cat or dog food would suffice, but feel free to put down raw meat or scraps from dinner. However, avoid feeding any processed meats, as they're likely to contain lots of salt and a range of additives, which aren't healthy for a wild bird. Magpies are fairly large birds, so they don't do well eating from hanging feeders. Of course, they'll give it a good go, but it's hard for them to balance so you're better off with a different kind of feeder. Platform feeders are an ideal choice, as they provide a sturdy base for magpies to feed from. However, they're also quite fond of feeding on the ground, so feel free to put their food directly on the floor. This isn't such a great idea if you have regular feline visitors to your garden. Like most birds, magpies prefer to visit gardens with some areas of wilderness, hedgerow or undergrowth, rather than one that's neatly manicured. Try cultivating some slightly wilder areas, as these will provide welcome cover. 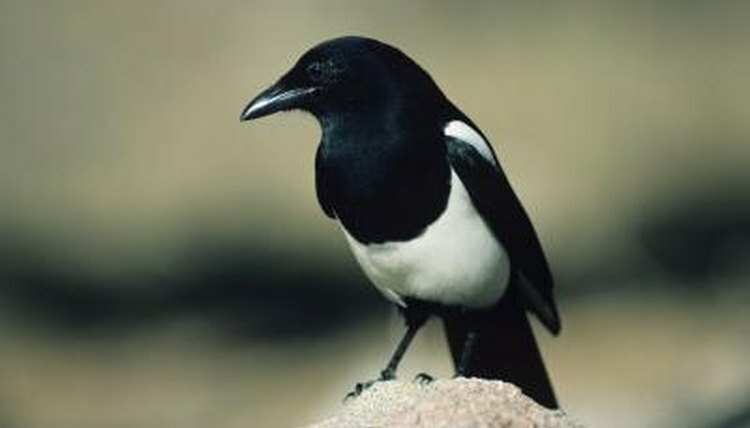 Water is another necessity for magpies, so they're more likely to visit your garden if there's a water source for drinking and bathing. A specialist bird bath is ideal, but a dish tub filled two-thirds of the way up with water will also suffice. What Does a Swift Fox Mostly Eat? Do Goldfinches Nest in Boxes? What Do Ducks Eat in Captivity?